Elon’s LGBTQIA Alumni Network is open to all lesbian, gay, bisexual, transgender, questioning, queer, intersex, asexual and ally graduates. There are no dues to join. Join the Facebook group for updated information about events and programs. Volunteer with one of the network’s committees. Contact alumni@elon.edu to learn about joining the LGBTQIA leadership team. 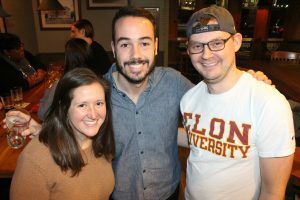 Complete the form below to join Elon's LGBTQIA alumni network.